Borger is a small town of just over 12,000 residents located on Highway 207 about 40 miles Northeast of Amarillo. Borger maintains a small town feel and is considered safe with good schools. One of the things we like about Borger is the cost of living and economy. Houses are less than half of the state average. You can find homes at a median price of $58,000 and apartments average $546. Borger’s economy has been experiencing a resurgence with oil production increasing at the Phillip’s refinery and recent expansion of the facility. Borger has a low unemployment rate (7% as compared to the national average of 10%). Jobs are also available in the surrounding communities and Borger is close enough to Amarillo to easily commute. We also like the food in Borger. We can find authentic Mexican fare right in town at Lorene’s Mexican Kitchen on N. Main. It is a family owned restaurant and the recipes all come from Lorene’s kitchen. Lorene’s in Borger claims to be the original home of Chili Rellenos (a mild pepper stuffed with cheese and sometimes meat, dipped in batter and crispy fried served with a green sauce). Lorene Richardson and her family have been serving the Borger area for many years and their Mexican Kitchen is a local favorite for lunch or dinner. Borger is just a few miles away from Lake Meredith. If we want to spend the day fishing or boating. we can head out on West Wilson to Ranch Road 1319, North of Fritch, and be there in no time. 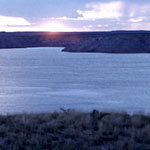 Lake Meredith also has an extensive hunting area and a camping facility for longer stays. Lake Meredith is a man made reservoir that supplies water to 10 communities in the area and is a great place to spend a day or a weekend. We like Borger, because it is a small town with a strong economy, low cost of living and an easy commute to nearby towns and recreation areas.